Dry stock farmers’ salaries have seen strong growth in the last year, according to Federated Farmers and Rabobank’s 2015/2016 employee remuneration report. Despite tough times and low inflation, most sheep, beef and grain farmers have been able to provide higher average salaries on a year ago – illustrating real income increases for many farm workers at all levels of experience and responsibility. Salaries in the dairy industry have remained stable, but for the first time there has been a very small decrease in the value of extras farmers provide their staff, such as firewood and internet access, pushing the total value of their package (TPV) down. . .
Left to Right: Roger Landers and Matt Kelbrick (Taranaki), Graham and Marian Hirst (East Coast), Shane Gibbons and Bridget Speight (Southland), Joe and Suz Wyborn (Canterbury), Richard and Dianne Kidd (Auckland), Daniel and Reidun Nicholson (Greater Wellington), John Hayward and Susan O’Regan, (Waikato), Brendon and Paula Cross (Otago), David and Adrienne Hopkins & Ben and Belinda Price (Horizons), Dennis and Rachelle O’Callaghan (Northland), Leighton Oats and Matt Nelson (Bay of Plenty).The 2016 Ballance Farm Environment Awards have delivered an outstanding line-up of Supreme winners from the eleven regions participating in the prestigious competition. Auckland is the latest region to join the Ballance Farm Environment Awards, with Helensville sheep, beef and forestry farmers Richard and Dianne Kidd claiming the region’s first Supreme title. 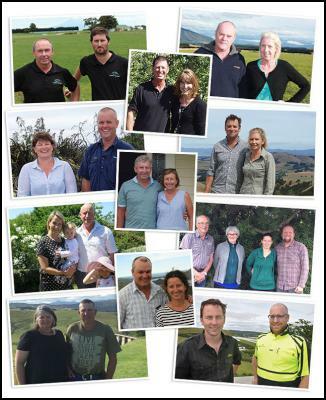 Fellow sheep and beef farmers Dennis and Rachelle O’Callaghan, Taipa, were Supreme winners in Northland, with large scale kiwifruit operation BAYGOLD Ltd, Paengaroa, winning in the Bay of Plenty. . .
Federated Farmers is thrilled the Ruataniwha Water Storage scheme in Hawkes Bay has made another significant step towards hitting the go button, after it was confirmed sufficient water sign-up will make the scheme cash positive. Hawke’s Bay Regional Investment Company (HBRIC) announced yesterday it has 196 Signed Water User Agreements, the numbers needed for the project to proceed. Federated Farmers Hawkes Bay Provincial President Will Foley says the dam will preserve the inter-generational nature of family farming in the Hawkes Bay. . . The body of an 87-year-old farmer who went missing in rugged Far North bush was found after searchers spotted a dog which had stayed near his side all night. The man was last seen about 1pm on Monday when he left home on his quad bike to check farm equipment on his Topps Access Rd property, just south of Kaeo. Family, friends and neighbours began a search when neither he nor the dog returned. They called police when there was still no sign of the pair by 8pm. The cattle dog, which was described as small and normally timid, was understood to belong to the man’s daughter but followed him everywhere he went. . .
University student Olivia Ellis works every time she goes home for a visit. She wouldn’t have it any other way. Home is a 320-hectare farm, Papawai, on State Highway 50 between Onga Onga and Tikokino in Central Hawke’s Bay… home also to parents Richard and Helen Ellis. They’ve been there since 1995 when Olivia was a toddler, along with big brothers William, who after qualifying as a builder is now shepherding near Timaru, and the late George, who worked for WaterForce in Ashburton before a truck crash in 2014. . . The global dairy trading platform owned by Fonterra is to expand further into online trading. GlobalDairyTrade (GDT), though owned by Fonterra, acts independently as one of the world’s leading dairy trading platforms. As well as its fortnightly auction, the company offer a new way for customers to trade in the 66-billion litre international dairy market. . .
Australia’s largest dairy processor Murray Goulburn has announced it will cut its milk price for suppliers, with managing director Gary Helou also announcing his departure. The dairy co-op says it is no longer feasible to pay $5.60 per kilogram of milk solids, and now expects to pay between $4.75-5 per kilogram, a drop of around 10 per cent. MG says it will introduce milk support payment programs to give suppliers an equivalent milk price of $5.47 per kilogram. . . The dairy crisis is hurting farmers across the world, as production far outstrips any rising demand. Farmers Weekly looks at the farmgate prices and milk production levels around the world and considers how milk producers are coping in different countries. See a snapshot of farmgate prices in the graphic and read the detail for each country below. The UK’s strength is a big liquid market — but that means dairy farmers are divided. The average milk price of 23.13p/litre in January hides a great split. . . .
AUSTRALIA’S approach to soil must dig deeper if our agriculture sector is to keep pace with its competitors. Government policy has for too long taken a narrow focus on soil, prioritising funding for research aimed at enhancing environmental outcomes, as opposed to research that delivers productivity gains. That’s according to soil researcher Andrea Koch, formerly of the United States Study Centre’s soil carbon initiative. . .
Canterbury and other parts of the country are continuing to struggle with dry conditions. The need to offload stock, particularly store lambs from farms is intensifying and it may be necessary to get large numbers of lambs to the North Island to help ease the pressure. Federated Farmers are trying to get a handle on the numbers we may have to deal with and if there are farmers in other parts of the country with surplus feed who may be interested in taking on lambs to finish. . . Dairy Women’s Network will be taking nominations for the 2016 Dairy Woman of the Year Award from 1 February until 11 March 2016. Sponsored by Fonterra, the Dairy Woman of the Year award recognises an outstanding woman who has significantly contributed to the dairy industry with passion, drive, innovation and leadership. The Dairy Woman of the Year is announced annually at the national Dairy Women’s Network conference, which in 2016 is being held on 4-5 May in Hamilton. Current Dairy Woman of the Year Katie Milne attributes her recent win in the rural category of the New Zealand Women of Influence Awards to her Dairy Woman of the Year title, along with her role as Federated Farmers national board member. . .
A total of 452 entries have been received in the 2016 New Zealand Dairy Industry Awards, a pleasing result given the economic climate in the industry. The awards have also undergone significant change for the 2016 awards programme, with entry criteria changing for all three competitions resulting in two of the competitions sporting new names. “Given this we are really happy with the result and we are pleased with the balance of entries across the three competitions,” General Manager Chris Keeping says. . .
Ngāi Tahu Holdings Board Chairman Trevor Burt is pleased to announce a new joint venture with the family-owned company, Watson & Son, one of New Zealand’s largest mānuka honey producers. Ngāi Tahu will own 50% of Wairarapa-basedv which focuses on the production and distribution of premium mānuka honey products; and 50% of ManukaMed, a related company focused on the medical applications of mānuka honey. . . The Environmental Protection Authority (EPA) advises a hearing is scheduled for an application to import for release the herbicide GF-2687. This herbicide contains two active ingredients that are new to New Zealand, halauxifen methyl and florasulam. It is intended to be used for the control of broadleaf weeds in cereal crops, including wheat and barley. The application from Dow AgroSciences (NZ) Ltd is for a wettable granule herbicide containing two ingredients that have not previously been approved under the Hazardous Substances and New Organisms (HSNO) Act and which are not components in any approved formulations. The submission period was from 8 June 2015 to 20 July 2015. . . The Canterbury A&P Association Elite Ram and Ewe Sale, held Friday 27 November, attracted a quality line up, with 231 Rams and 11 Ewes entered into the sale. With 144 rams selling, the average sale price was $1861 and $250 for ewes with 6 selling; total sales of $269,500 were recorded. The highest price was reached by a Clifton Downs Southdown Ram (Chris Medlicott, Waimate), selling for $16,000. Other top prices were as follows: Corriedale – $2900 (Wattlebank, GR and RW Wilson, West Melton); Hampshire – $3100 (Blue View, Gudex Family, Ashburton); Romney – $2400 (Gatton Park, DA & SJ Wyllie, Ashburton); Poll Dorset – $2000 (Brooklands, A&P McIlraith, Leeston); Border Leicester – $4000 (Hermiston, GJ Letham, Ashburton); Texel – $4000 (Hemingford, SEJ & V Holland, Culverden); South Suffolk – $4200 (Inver, SJ Sinclair, Ashburton); Suffolk – $6700 (Stoneylea, AW & JH Adams, Christchurch). . .
NZ organics company Ceres Organics is spearheading action to diversify the world’s organic almond supply and take pressure off Californian almond growers, in response to one of the most severe droughts in California’s history. Currently, California provides 80 per cent of the world’s almonds and with the drought affecting supply, the price of almonds has risen 40 per cent globally. Ceres Organics is one of the biggest suppliers of organic products across Australasia with around 400 products in the range and at least 40 of these contain organic almonds. Managing Director of Ceres Organics Noel Josephson said the drought in California highlighted the issues associated with having mono-crops and the need for global crop-diversification. . .
New Zealand Wool Services International Limited’s C.E.O, Mr John Dawson reports that the more versatile and stylish South Island selection on offer this week saw most types well supported, despite a slightly firmer New Zealand dollar. Compared to the last sale on 26th November the indicator for the main trading currencies was up 1.05 percent only having minimal impact in some quarters. Mr Dawson advises that compared to the last time sold on 19th November, Merino Fleece 20.5 microns and finer were firm to 1.5 percent easier with 21 to 23.5 microns 1 to 3 percent dearer. . .
BIG train, big gain: That’s the aim for the longest grain train to haul wheat to port in Australia. The train, rivalling the coal industry’s heaviest efforts, hauled out of Narrabri this morning and unloads at Newcastle Agri Terminal (NAT) tonight, its cargo bound for South East Asia. Longer trains deliver bigger loads and squeeze more value from the scant rail slots available on the coal-laden Hunter Valley line. The massive train – which is 1.3 kilometres long – is snaking across the North West farming districts and over the Great Dividing Range to port. . . Proud to be a farmer supporting animal welfare.